There will be a choice between watermelon and squash, and this is the last week for watermelon and just the first week for squash and, so keep that in mind when making your selection. This is the last week for the 15 week shares – So if it’s your last week the thank you so much for taking part and hopefully I’ll see you this week at the drop off. We were caught be surprise Thursday night with frost. The frost toasted (yes frost can toast things) our cucumbers, tomatoes, zucchini, etc. 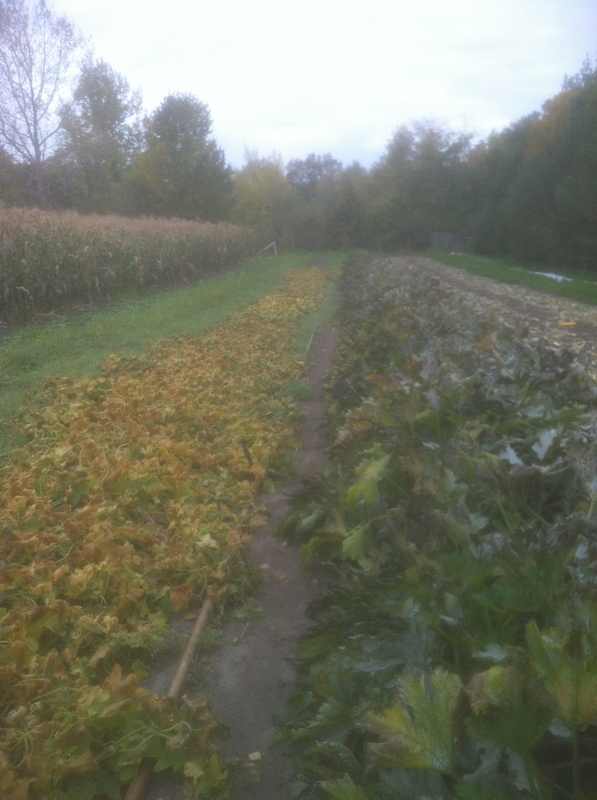 This marks the end of the summer crops and the beginning of the fall crops fall crops: (winter squash, brussel sprouts, cabbage, etc.). We picked all the rest of our tomatoes monday in anticipation of another heavy frost and will be giving them out as they slowly ripen. We’ll be giving out what we have for leeks, and making up for the rest with onions. The mosquitos have subsided and the weather is nice (or was when I wrote this yesterday! ), so we’re going to have our farm day this Sunday sept 23 from 2-5. The day will give everyone a chance to come see the farm and have a brief taste of farm life. We’ll have a farm tour at 2, do some vegetable picking at 3 and a potluck from 4-5. We may also squeeze in a tractor ride and some soccer. For the vegetable picking part of the day, people will be welcome to pick extras of certain vegetables to take home (mostly spinach). For the potluck please bring your own dishes, and we won’t have access to a kitchen for heating food up – so keep that in mind. Also, we’ll be planting garlic that day in the morning, so if you’d like to come experience planting garlic, you can show up any time after 12 and drive as for as the driveway goes and meet us in the field. The simplest way to find the farm is to take hwy 8 north until rd 229 (winnipeg beach/komarno turn off). Turn west (left) on rd 229 and go app 8 miles until rd 13. Turn south (left again) on rd 13 and in 1.5 miles there will be a sign on the east (left again) side of the road saying ‘Plum Ridge Farm” . Turn into that driveway and drive until you pass a large field and then park among the trees. That’s all there is to it! Hope to see you Sunday, and if not see you at the pick up.